Top 200 Most Fantastic Library and Information Science Articles and News Every Librarian Must See. 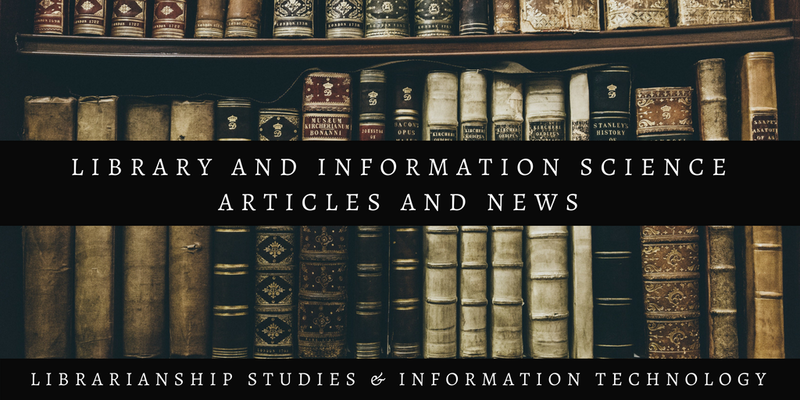 Library and Information Science Articles and News is an initiative of Librarianship Studies & Information Technology blog to showcase the latest LIS news, articles, events, and updates for librarians, catalogers, metadata, archives, and knowledge professionals. It is an attempt to make a representative compilation of most popular news and stories for libraries and librarians which were shared through its Google+ Community, Facebook Page and other social media platforms of the Librarianship Studies & Information Technology blog during the years 2014-2018. I always wanted to keep myself updated with latest news and updates in Library and Information Science. I do this by reading various authoritative sources in the library and information science. Then I share it with the readers of Librarianship Studies & Information Technology blog which already has various followers of its social media platforms to share popular LIS news. So an idea came to my mind to create a blog article with top quality news on Library and Information Science which were most liked and shared. The newsfeed is sourced from Librarianship Studies & Information Technology Facebook Page and Librarianship Studies & Information Technology Google+ Community (which is organized based on the categories (or labels) of Librarianship Studies blog). Librarianship Studies & Information Technology is divided into following broad categories. Categories are listed on the top left side of the blog. These categories or labels group blog posts on a specific topic of Library & Information Science. Subject access to OPACs: exploiting the capabilities of FileMaker Pro for designing a novel interface - M.Phil. thesis by Prof. Shabahat Husain. - Loughborough, England: Loughborough University, Department of Information and Library Studies, 1992. vii, 128 pages. Abstract: Ever since the libraries came to being, subject access has had been a problem. More often than not, subject searches result either in no retrievals or too many records, discouraging users to proceed further. Solutions to these problems were found in improving search methods, indexing techniques, developing user-friendly novel interfaces and other methods. "The present work attempts to tackle the problems of subject access using an experimental online catalogue by designing a graphic front end user interface, wherein an enhanced indexing technique that is traditional classification system coupled with improved search method by providing end user thesaurus were incorporated by using Macintosh compatible software package called FileMaker Pro. The system provides subject access by three methods i.e. Class Number Search (CNS), Subject Heading Search (SHS) and Keyword Search (KWS) to cater to the needs of two different levels of users i.e. naive or ordinary level and another for the experienced or advanced level users. A cross section of the searchers were invited to evaluate the interface. On the basis of their reactions, certain recommendations were made for the improvement of the system. In the process the capabilities and limitations of FileMaker Pro were assessed and suggestions were given for its further improvement. Certain points pertaining to the further research on the subject were also recommended. Library of Congress Classification (LCC): Intermediate (Webinar - Self enrollment) - This session will focus on the selection and construction of LC Classification (LCC) call numbers for literature, maps and atlases, and moving images, including the construction of cutters for literary works and juvenile belle lettres. Library of Congress Classification (LCC): Introduction (Webinar - Self enrollment) - This session will briefly introduce the history of LC Classification (LCC) and the general principles of classification. Participants will be introduced to the Classification and Shelflisting Manual and learn how to make use of Classification Web, Authorities.loc.gov and the freely-available LCC schedules to select classification numbers. There will be special focus on the use of the LC Cutter table and when to use it. Shelving with Library of Congress Classification (Self-paced Course - Self enrollment) - This course provides a great introduction for any library staff, assistants or volunteer needing to learn how to shelve items by the classification system used by the Library of Congress (LC). One of the most time-consuming tasks for library staff is training assistants and volunteers about classification systems and how to properly shelve materials. Few tasks are more vital for shelf maintenance and patron access. This lesson provides online training that will help new staff members and volunteers become productive as quickly as possible with a minimum of time investment by the professional librarian. After completing this training, the learner will be able to accurately read shelves and properly file materials according to Library of Congress (LC) standards. Knowledge Organisation and Contemporary Art: Cataloguing Practices in two Libraries in Sweden, Umeå universitetsbibliotek and Konstbiblioteket - This master thesis aims to examine the use of universal classification systems and other forms of controlled vocabulary, such as thesauri and subject headings, in the field of the visual arts, with a special focus on contemporary art. Will Librarians Be The Overseers Of The Information Age? - Julie Todaro, President of the American Library Association, ALA and Eleni Miltsakaki, founder and CEO of Choosito! sat down with Rod Berger to discuss the role of librarians in today's schools. Contrary to the widely held notion that the role of the librarian is shrinking, both Todaro and Miltsakaki make strong arguments for the increased importance of librarians as overseers of an endless stream of Internet data. Todaro and Miltsakaki agree that students, more than ever, need the guidance of librarians in their educational lives. The Librarian Who Guarded the Manhattan Project’s Secrets - While dodging accusations of communism, Charlotte Serber made the nuclear bomb possible. This Is the Future of Libraries in the Digital Age - With the cyberage in full swing, this is how smart design is keeping demand for the printed word alive. North Carolina State University, James B. Hunt Jr. Library : A new state-of-the-art library gives a campus a heart - When administrators at North Carolina State University (NC State) decided to build the James B. Hunt Jr. Library at their Centennial Campus in Raleigh—a unique research park that encourages collaboration between the university, government agencies, and some of the world’s most innovative companies—they wanted to create a building that would strongly position the campus as a place of the future. To see evidence of this intent, look no further than the bookBot, a robotic system that delivers in less than five minutes any of two million books that students can select from a virtual catalog. The system, which stores the books in 18,000 bins, has allowed the university to shift their focus from storing books to accommodating the diverse needs of students and faculty. Library of Congress Book Conveyor Tunnel - A fantastic array of trays and cables once whisked books over to the Capitol at 600 feet per minute - In the age of the Industrial Revolution, libraries at the cutting edge experimented with an array of pneumatic and mechanical devices that had books flying around, over, and under their technologically delighted patrons. There was no greater example of this steampunk marvel than the Library of Congress, which once connected with the U.S. Capitol Building with a single-purpose book conveyor tunnel. Library of Congress LABS - a place to encourage innovation with Library of Congress digital collections. The Library of Congress opened its catalogs to the world. Here’s why it matters - Imagine you wanted to find books or journal articles on a particular subject. Or find manuscripts by a particular author. Or locate serials, music or maps. You would use a library catalog that includes facts – like title, author, publication date, subject headings, and genre. Behold! The Library of Congress's audacious plan to digitize and share the nation's treasures - The Library of Congress has published its latest digital strategy, laying out a bold plan to "exponentially grow" its collections through digital acquisitions; "maximize the use of content" by providing machine-readable rights data and using interoperable formats and better search; to support data-driven research with giant bulk-downloadable corpuses of materials and metadata; to improve its website; to syndicate Library assets to other websites; to crowdsource the acquisition of new materials; to experiment with new tools and techniques; and to preserve digital assets with the same assiduousness that the Library has shown with its physical collection for centuries. Former National Library of France reopens after a decade of renovation work - the former site of france’s national library has reopened after years of renovation work by architects bruno gaudin and virginie brégal. located at rue de richelieu in paris, the historic complex houses the collections and reading rooms of the manuscripts department, the maps and plans branch, the coins, medals and antiques bureau, and the performing arts office. since 1993, the quadrangle has also been home to the french national art history library. State of America's Libraries Report 2017 - In the 21st century, libraries of all types are responding to the changing social, economic, and political impacts of living in a digital society. Academic, school, and public libraries provide services that empower people for change. Library workers’ expertise, combined with dynamic collections and digital resources, help individuals develop new skills, communicate with others through new technologies, and help make their communities better places to live. These and other library trends of the past year, including the Top Ten Most Challenged Books of 2016, are detailed in the American Library Association’s 2017 State of America’s Libraries report. Universities redesign libraries for the 21st century: fewer books, more space - UC Berkeley’s newly remodeled undergraduate library is modern and sleek, with its top two floors featuring low-slung couches, a futuristic nap pod, and meeting spaces with glass walls made to be written on and colorful furniture meant to be moved. Timothy Cole Wins 2017 LITA/OCLC Kilgour Research Award - Timothy Cole, Head of the Mathematics Library and Professor of Library and Information Science at the University of Illinois Urbana-Champaign, has been selected as the recipient of the 2017 Frederick G. Kilgour Award for Research in Library and Information Technology. How Mobile Technology Changes the Library Experience - The library experience of today is greatly different from that of even 15 years ago, and mobile technology is the leading contributor to these changes. In response, public and college libraries are using mobile technology to increasingly enhance the user experience. By embracing the many growing capabilities of mobile technologies, libraries provide better service to their users in many different ways. Here are just some of those ways. University Libraries Collaborate on Web Discoverability Project - Stanford and Cornell are leading library efforts to help machines understand bibliographic information so it will be searchable on the Web. Top Library Tech Trends - Tech leaders recommend the tools and resources your library can adopt now and in the near future. From virtual reality to gamification to security techniques, libraries are using the latest technology to engage patrons, increase privacy, and help staffers do their jobs. American Libraries spoke to library tech leaders—members of the Library and Information Technology Association’s popular Top Tech Trends panel from the 2017 Midwinter Meeting & Exhibits—to get the apps, devices, software, and best practices that you can adopt for your library right now and in the near future. Library Systems Report 2017: Competing visions for technology, openness, and workflow - The library technology industry has entered a new phase: business consolidation and technology innovation. Development of products and services to support the increasingly complex work of libraries remains in an ever-decreasing number of hands. Not only have technology-focused companies consolidated themselves, they have become subsumed within higher-level organizations with broad portfolios of diverse business activities. The survivors of this transformed industry now bear responsibility to deliver innovation from their amassed capacity. Modern web-based systems delivering traditional library automation and discovery capabilities are now merely table stakes. Real progress depends on building out these platforms to support the new areas of service emerging within each type of library. Online Teaching Skills for Library Workers - Design for Learning: 21st Century Online Teaching and Learning Skills for Library Workers (D4L) is a training program designed to enable library workers to transfer their in-person teaching skills to the online environment.